A pet dander allergy is caused by the dead skin cells of our pets. It is these skin cells that irritate the skin. An animal's hair and saliva can also be a problem. As much as we love our cute, furry friends, they can play havoc with our skin. Some of our pets have a free reign of our house. Going where they want, doing as they please. Leaving their skin, hairs and saliva all over the place. These help make up the content of house dust. If they live in a cage or a hutch they will also need some handling and exercise. It is the proteins in the hair, fur and skin they shed that cause the irritation. There are conflicting studies on whether owning a short haired breed would be better than a long haired one. The problem is that all varieties moult. Though a dog with with shorter hair has less hair to lose. As with dogs, a cat's skin and hair can be the cause of a pet dander allergy. It is also a cat's saliva that has been reported to be an issue. It contains proteins that can cause irritation. Our feline friends are clean freaks. They constantly wash themselves. So saliva gets everywhere. Not a lovely thought! It is a bird's feathers and droppings that have the potential to cause an allergic reaction. Though a reaction is less common than with hairy and furry animals. If you own a bird, just be vigilant. Especially if they are let out of their cage to fly about in your house. As you can imagine, feathers and droppings can end up everywhere. If you have a pet dander allergy be careful with any animal that has hair or fur. Including rabbits, hamsters, guinea pigs and horses. If your pet is housed outside they will unlikely to be as much of a problem. Care just needs to be taken when handling them. Wearing a pair of gloves will help. Always get advice on how to keep and look after exotic pets. Do this before you buy. It wont be so much of a shock of how time consuming they can be or how expensive. The animals listed above wont make ideal pets for everyone. So if you want a cuddly one, I personally don’t think stick insects are cuddly, look into the best one for you or your child. Not all types of animals affect everyone. A certain breed of cat may affect you, but another breed may not. If you have a friend or relative that own a certain breed that you are looking at buying, spend some time with it. Stroke it, play with it and, if appropriate, take it for a walk. After spending some time with the animal look for any adverse reactions. Does your skin feel itchy and look inflamed? Or do you have any other signs of pet allergies, like wheezing? If there is no sign of an allergy don’t assume that there wont be in the future. It may take a little while to show itself. If it causes an irritation, a mild itch, this will be apparent straight away. 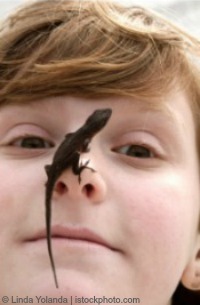 In the first few years of a child's life they have contact with different animals. This may help to work out which ones they should try to avoid in the future to prevent a pet dander allergy. If you already have a much loved pet then the thought of having to re-home it may have crossed your mind. Especially if there is a severe reaction to having it in the house. Removing a pet from a home is not normally advised. The emotions that it would cause, especially with a child, could have a negative impact. It may be difficult to work out if your favourite furry companion is the source of the flare up. You could try a separation period to see if there is any improvement. Though your pet's hair and skin could still be around the house for a while. So this may not help you know either way. 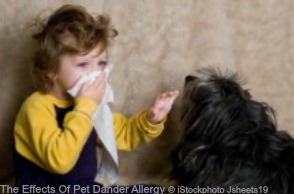 There are some precautions you could take to limit the effects of a pet dander allergy. Keep your pets clean. Wash weekly. If using products product your hands. Also brush them to help get rid of any excess hair, before it ends up in your carpet! Having a pet can help reduce stress, which is another trigger of stress. It is relaxing to stroke them and play with them. Walking a dog gets you same exercise and fresh air. That will help you to unwind. I lived in the same house as a cat for quite a few years. My skin was slightly irritated by his fur. This was made harder to control because he had been given the run of the house. He went everywhere and sat on everything. We would find fur everywhere. I used to keep my bedroom door shut and run a hoover around very frequently. As my reaction wasn’t severe just doing a couple of small things seemed to help. I do have a problem with some dogs. An irritation after I have stroked them. I have to wash my hands straight away. So if I go out I always tend to carry a pack of baby wipes with me. For me using them is better than doing nothing. There are definitely some positives to owning and caring for an pet. You just have to weigh these positives with any negatives and make the best decision for you or your child.